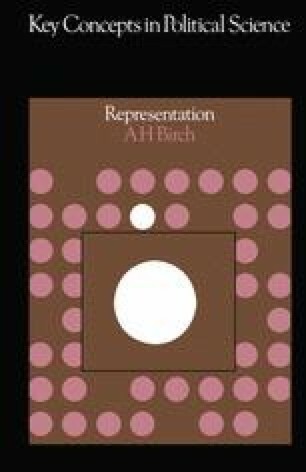 The concept of representation, like those of liberty, equality and democracy, has been developed more by politicians and propa­gandists than by political scientists. Like these other concepts, it has favourable connotations, so that few people are openly opposed to it. Like them also, it is a rather loose concept, which has been used in different ways by different writers, each of whom tends to claim that the meaning he attributes to it is the only proper meaning. In this situation the role of the impartial scholar is to disentangle the various meanings and show their relationship to one another, just as it is his role to explain and classify the various functions which representation can serve. It may be asked, how­ever, whether this is enough. Should the scholar leave it at that, or should he follow his analysis with an attempt at synthesis, so that the study can be concluded with a definition of the true nature and functions of representation?